How many times have you observed a cat doing an act that somewhat looks like it is massaging the surface or trying to mould something out of it? You see it once and it melts your heart and subsequently, it probably becomes your source of entertainment because let's be honest guys, the act, to a certain extent IS funny. There are a plethora of YouTube ‘Cat Kneading’ videos we could consume in light of humour and general cuteness. 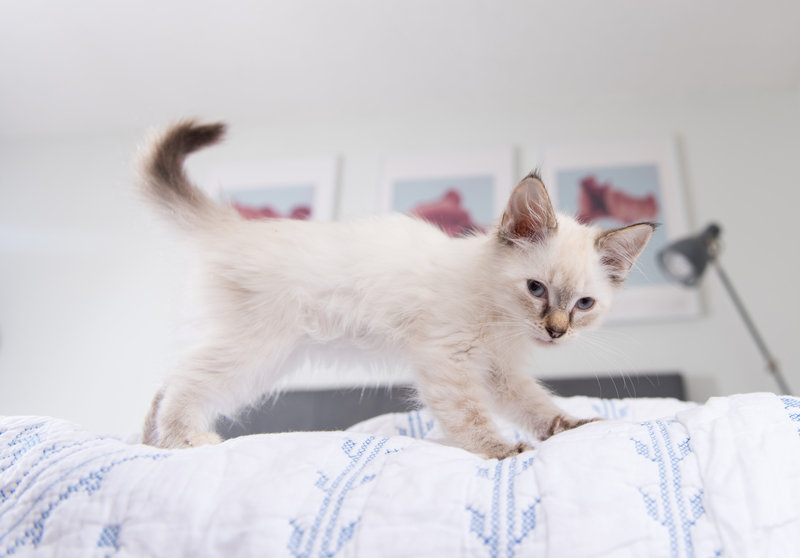 But if you ever wondered what exactly the act is and why do cats do that, here’s a lowdown on all that you need to know about this act called “kneading”! Kneading is the movement done in order to stroke, massage, mould, pound, rub and/or blend something. Typically observed the most in spaces like the kitchen, thanks to our feline fellas, the act is a common sight outside the kitchen too! Almost skillfully, cats alternate their front paws to knead the surface of their choice to a rhythm they attune with. The style may vary cat to cat; some may use all their paws, some just four. Coming to the case in point, cats knead when they are experiencing a state of ease. Listed below are the seven most common triggers. The evolution of cats has been remarkable. Cats have come a long way from treading down foliage to make a restful, temporary nest to having their own snug blankets and cosy beds. Kneading starts way early in the life span of a cat. It is how newborn kittens stimulate milk secretion in their mothers. Fostering the second point, cats use kneading as a way to communicate love. Since the behaviour is a remnant of infancy, they relate the act to their mothers love and of course innocent times. Ever noticed a rather aggressive kneading of your cat? This could either be on the surface of their choice or their owner. Both imply an intense need to be loved by the cat. In fact, deeper the paws sink, more the love! Thus, the next time you see this happening make sure to give your cat a good, loving back rub. Kneading imbibes a sense of relaxation and zen. Not to mention, how they ancestrally made temporary houses to rest, as mentioned in the first point. Safe to say, kneading is a prelude to sleep. Purring is prominent when kneading happens. Purring, by itself can be related to a host of activities that make a cat feel comfortable and good. Combining the aforementioned factors is the fact that cats purr the most when they are kittens and are being fed off their mothers, a naturally satiating act. It's a known fact how cats are stretch lovers. If the yoga asana, Cat Pose, rings any bell! Kneading is said to be an activity that cats love to do in between their naps! With this list, we have covered some of the most primary reasons why a cat kneads. However, being the feline beings that they are, you can never predict what exactly is making them knead at the moment!